Team meetings have a pretty bad reputation. Most people either shiver or yawn only when hearing the word. The main reason is that uninspired leaders hold people hostage for hours, while delivering dull speeches or presentations that no one actually is interested to hear. But you can do better! We know that you don’t want to be one of those uninspired leaders. 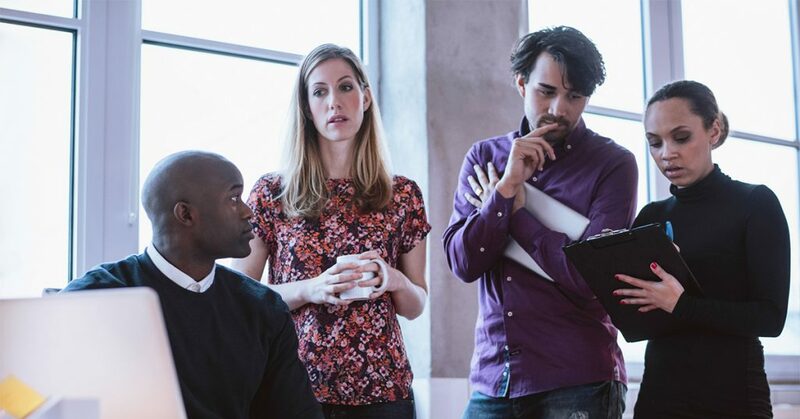 Continue reading this article to find out how you can improve your meetings to increase collaboration and productivity while keeping your people happy and engaged. People already have a poor opinion about team meetings, so a negative attitude from the managers will only make everyone hate them even more. As a leader, the last thing you should do is complain about the meeting. Instead, set an example for everyone else and keep the moods up. Delegating tasks is always in your power, and sometimes shows your leadership abilities. However, meetings are your opportunity to interact with your team and help them achieve the results that you are seeking. It’s not just an activity to check off a to do list. Therefore, if you make an assistant or other team member responsible for planning your meetings, the purpose is defeated. Take charge of the meetings from beginning to the end and make sure you achieve the purpose. Speaking of purpose – every meeting should have one or more goals. There is no point in holding a meeting just for the sake of it. Make a list of goals, and once the team meeting begins, have a very clear idea of what you wish to achieve. Once you have a list of goals, it’s easy to plan your team meetings in more detail. Prepare an agenda in which you identify the main talking points and subjects you wish to discuss. If your team needs to make decisions, be sure you allocate enough time to get people familiar with the topic beforehand. Actually, it’s a great idea to send the agenda in advance so that your team will know what to expect from the meeting. Furthermore, add any documentation you might have, so people will have time and all available means to prepare. You should also include a set of rules for the meeting. Make clear what is the policy on running late, or whether screens are allowed in the room. Meetings don’t necessarily mean conversations and presentations in the conference room at your office. Spicing things up is actually proven to increase productivity and make meetings fruitful. Make things interesting by including a warm-up round in which each participant gets a turn in saying how they’re feeling, present their latest achievements, and say what they are expecting from the meeting. Bring some fun into the meeting by watching relevant videos or playing short team-building games. To stir things up even more, you can hold your team meetings outside the office, in a location that would sparkle creativity and put everyone at ease. Doing things differently will stimulate everyone’s curiosity and creativity, so don’t be afraid to make changes. Having the right people in a meeting is crucial. Not everyone needs to participate in every meeting, but you also don’t want anyone to feel left out. Productivity experts warn that having more than 6-8 people in a meeting might actually be counterproductive. Therefore, make sure you identify the right participants in accordance with your goals and agenda. Invite the people who need to take part in the decision-making process only if there are decisions to be made. Otherwise, their time might be put to better use. Invite those who can make a difference in the final outcome and whose input is important for achieving the goals on your agenda. Meetings are perfect opportunities for brainstorming and collaboration. Put your minds together to come up with new ideas or find solutions for current problems. Use various techniques for effective brainstorming, like collaboration sheets or rapid ideation. Encourage everyone to participate, even if some team members are less vocal than others. Every idea is important and innovation is born out of multiple ideas built on top of each other. Even though we can’t live and prosper without them, we have to acknowledge that organizing and participating in meeting is somewhat of a hassle. Disrupting the activity of several employees, having people go back and forth through the office, dealing with late show-ups and interruptions – all make meetings the dreadful events that so many people detest so much. Luckily, in this day and age there is a way around most of those: move your meetings online! With the help of team collaboration solutions such as Hubgets, you can run meetings from the comfort of your desk chair. No need for booking large conference rooms, or disrupting your teammates by wandering around the office. Participants can hear each other or they simply can just chat. They can share their screens in real-time, exchange any type of files, watch videos together. And everything will be stored for later review. But the greatest perk is that in a world of globalized workforce, it allows your remote employees to take part in meetings without the need of even being on the same continent. Meetings don’t have to be the scarecrows that everyone thinks so low of. With the right tools, you can create an interesting and stimulating environment for people to enjoy. As a leader, it is totally up to you to plan and run the meeting so that people will participate in a productive way. Doing things differently can be a great idea that might inspire people and make the most out of your meetings. Next, you can take one step ahead and move your meetings online, allowing everyone to participate without great efforts. Maximum results with minimum resources is the exact definition or productivity.